Josh Moreman in action for Peterborough Sports against Basford at the weekend. Photo: James Richardson. 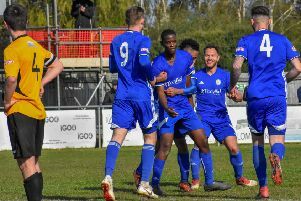 Deeping Rangers could move up to second in the United Counties Premier Division with a win over Boston Town at the Haydon Whitham Stadium tonight (November 7). Three points for Deeping and defeat for Newport Pagnell at Desborough would move Michael Goode’s men up two places. Zak Munton scores for Peterborough Northern Star against St Andrews at the weekend. Photo: Chantelle McDonald. @cmcdphotos. Blackstones would consolidate third place in Division One with a win at mid-table Harrowby United. There’s county cup action for Peterborough Sports and Peterborough Northern Star with the former hot favourites to see off lower level Cogenhoe in a Senior Cup quarter final at PSL. Title hopefuls Wisbech Town and Holbeach United are in UCL Premier Division action tomorrow (November 8). Northants Senior Cup quarter-final: Peterborough Sports v Cogenhoe. Premier Division: Deeping Rangers v Boston Town. Division One: Harrowby United v Blackstones. Northants Senior Cup quarter-final: Brackley Town v Peterborough Northern Star. Hunts Senior Cup quarter-final: St Ives Town v Huntingdon Town.